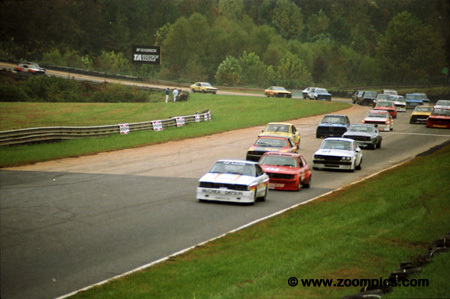 The 1983 Champion Spark Plug Road Racing Classic took place at Road Atlanta on the weekend of October 21-23. The event would decide the Sports Car Club of America's (SCCA) national champions in 22 classes. There were changes in the GT classes for 1983. In 1982, there had been four-categories but now there were five. The class formerly known as C Production became GT2 and all subsequent class were renamed - the former GT2 became GT3 and so on. GT classes boasted a large number of entries - in total there were over 120 GT entrants. Mike Rickman in a Datsun 200SX leads the GT3 field followed closely by Volkswagen Scirocco of David Rugh. Rugh challenged Rickman for the first 8-laps and when he faded Bruce Short in a Mazda RX-3 was there to apply pressure for the remainder of the race. Despite these threats, Rickman won the National title by just under 0.4-seconds. Jerry Hansen entered four classes at the 1983 Runoffs - he started three and won two national championships - A Sports Racer and GT1. 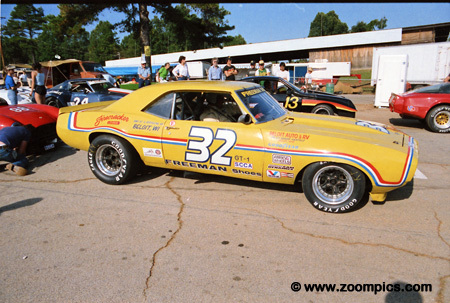 He qualified his Pontiac Firebird third behind Paul Newman in a Datsun 280ZX-Turbo and the Corvette of Doug Bethke. An incident mid-race at turn-11 forced officials to use the pace car which worked to Hansen's advantage and allowed him to win by 23.386-seconds. 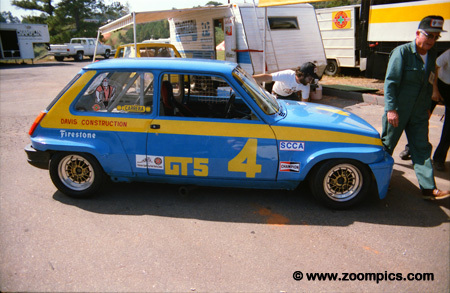 Class re-alignment in 1983 resulted - competing in GT5. 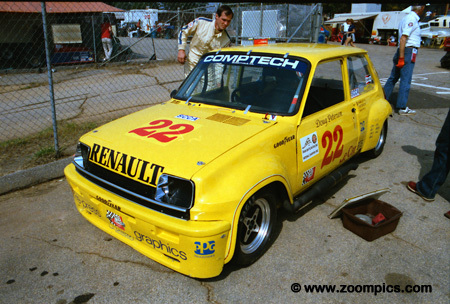 1982 GT4 National Champion Doug Peterson in a Renault LeCar returned in the new class. He qualified on the pole more than 3-seconds quicker than the second fastest starter and a second quicker than the GT4 pole. He led flag-to-flag and finished a comfortable 6.337-seconds ahead of Robert Yakushi in Datsun 210. This Mazda GLC was driven in GT4 by Dan Robson. 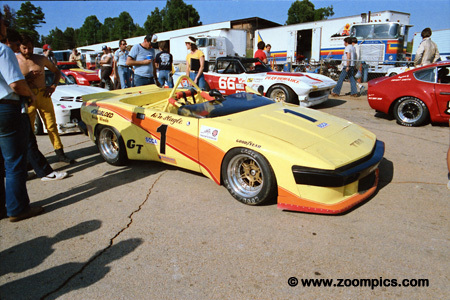 The lone Mazda in GT4 qualified third at the 1983 Runoffs. After 18-laps, he took the runner-up position 4.718-seconds behind David Carkhuff in a Datsun 510. Dr. Bill Coykendall had a lot of success in Datsuns. 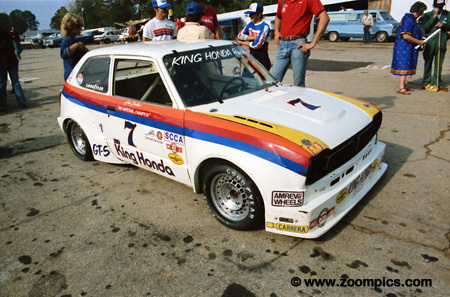 He qualified on the pole three times and captured the 1979 B Sedan National Championship in a Datsun. 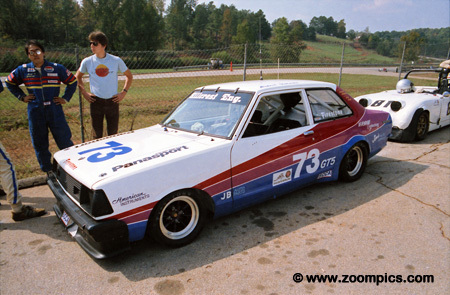 At the 1983 Runoffs, he tested a Volkswagen Scirocco but qualified his Datsun 200SX in third and finished fifth. A Southwest regular during the 1980s was Malcolm Garrett - he won his division's title numerous times. At the 1983 Runoffs he competed in a Datsun 710 starting nineteenth and finished seventeenth. 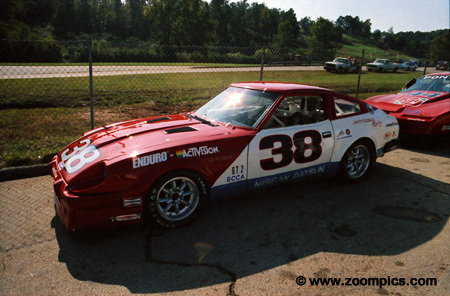 Ken Slagle captured the Northeast Division GT1 title in this Triumph TR8. Based on the TR7 the original prototype was produced in 1972 but it was unavailable to the public until 1978. The delay was caused by British Leyland's financial condition, labour issues and a shortage of engines. Fitted with a 3.5-liter engine it was described as Britain's answer to the Corvette. Slagle started fourth and finished second. In addition to Doug Peterson's GT5 Renault LeCar there was the entry of Duane Davis. This was Davis' first Runoffs - he qualified and finished third. He would go on to have success in a number of classes. To date, he has a total of thirteen National Championships which ranks him second to Jerry Hansen. Hansen has twenty-seven National titles. The GT2 class takes the green. Jumping into the lead is the Mazda RX-7 of Robert Reed. 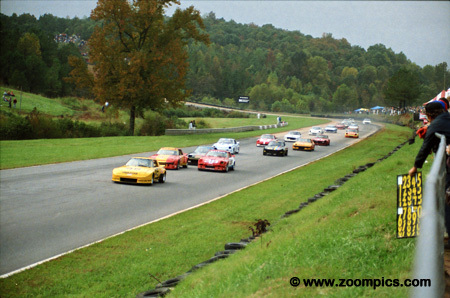 Reed would not be challenged during the 18-lap event and finished over 9-seconds ahead of John Finger also in an RX-7. 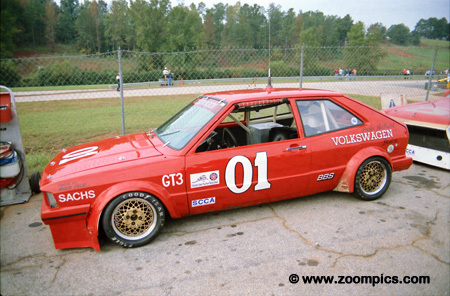 In 1982, Reed won the C Production National title in the same car. GT2 replaced C Production as part of the class changes in 1983. 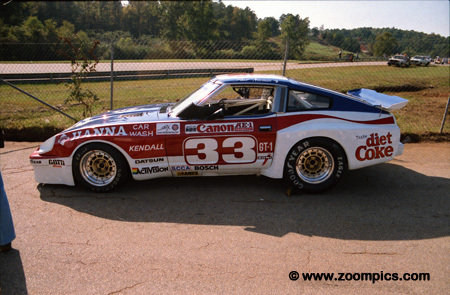 Paul Newman and the Bob Sharp Datsun 280ZX Turbo were a formable combination in 1983 and favored to take the GT1 championship. Newman qualified on the pole but tangled with second place starter and defending GT1 National Champion Doug Bethke in a Chevrolet Corvette on the ninth lap. This led to Newman's retirement - he was classified as twenty-first. 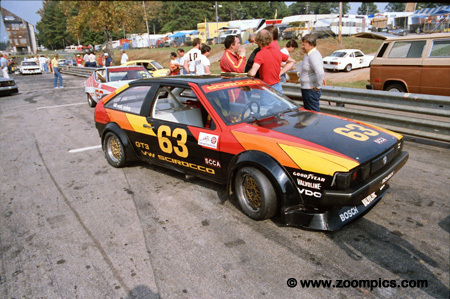 The second fastest qualifier in GT3 was David Rugh driving a Volkswagen Scirocco. He was the North Pacific champion taking the division by one point over 1983 National Champion Mike Rickman. Rugh gave pole-sitter Rickman all he could handle for the first 8-laps but he faded finishing twenty-second. The South Pacific Division GT5 was won by Datsun engineer Robert Yakushi. Yakushi drove a Datsun 210 and had a perfect 72-point season. Yakushi qualified fourth at the Runoffs behind Doug Peterson, Michael Cheung in a Datsun 1200 and the Renault LeCar of Duane Davis. He was able to finish second at the checker - 6.337-seconds behind Peterson. Jerry Dunbar competed in seventeen National Championship events - always in General Motors products - Chevrolet Corvette, Pontiac Trans Am and Chevrolet Camaro. In 1980, he won the National GT1 title driving a Camaro. At the 1983, Runoffs he started ninth but did not finish the race and was classified twenty-fifth. Jerry Barker was a well-known Triumph Spitfire competitor. He made eleven Runoffs appearances in British Leyland products. Barker won the National G Production title in 1975 and in 1980 he captured F Production. 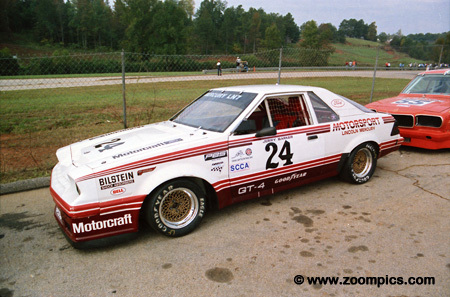 For the 1983 season, Barker switched to GT4 class and competed in a Mercury LN7. The Southern Pacific Division Champion started tenth and captured the final position on the podium. 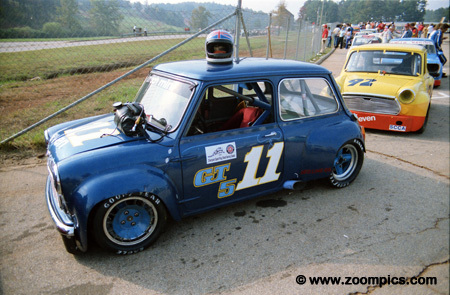 Jack Baumgardner was a perennial competitor in a Mini Cooper S. He entered the Runoffs on nineteen occasions with his best result being the runner-up position in 2003 at his home track - Mid-Ohio. In 1983, Baumgardner qualified tenth but was a DNF after 8-laps which resulted in a twentieth place finish. Beginner's luck? James Dentici won a National Championship in his first attempt. In 1981, he entered the GT5 class and starting second won the title. However, before Dentici entered his first Runoffs, he had a history of success in other forms of motorsports. Always in a Honda product he has earned five National titles. In 1983, he would qualify fifth but finished fourteenth. The Fortech Mini of Mike Kearney was always a fan favourite. 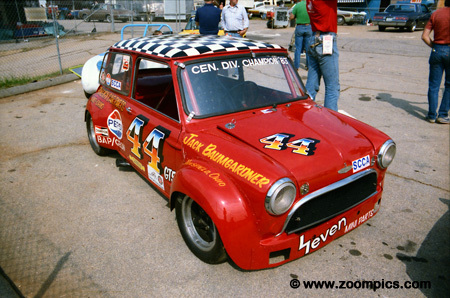 He employed drivers with a history of success such as Bill Cooper, Duane Davis and Doug Peterson to race his Minis. 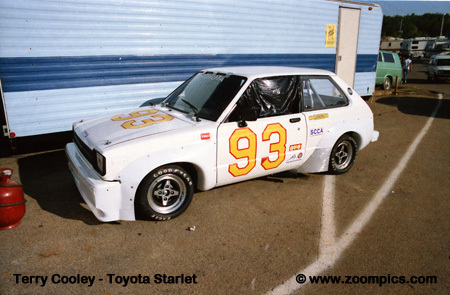 For the 1983 event, Kearney drove the car. He started fourteenth but was only able to complete 6-laps before retiring and finished in twenty-first place. 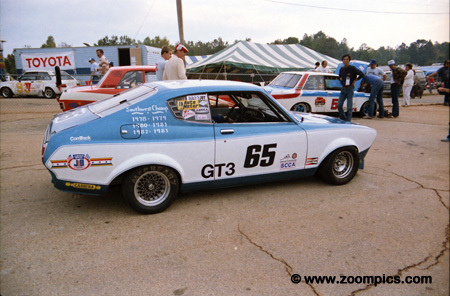 Jim Fitzgerald led the GT2 charge for Datsun in a 280ZX. He started second but he was passed by the Mazdas of Robert Reed and John Finger. 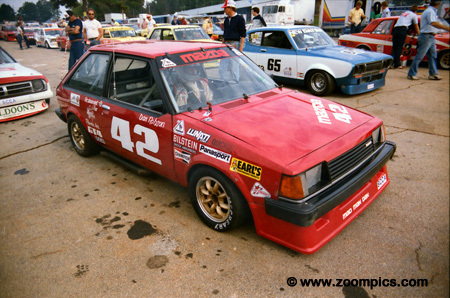 In 1970 and 1984 Fitzgerald won SCCA National Championships - on both occasions in a Datsun/Nissan product. 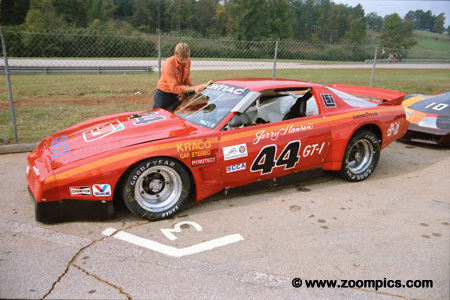 He would join the pro ranks and, unfortunately, in 1987 he died as the result of injuries suffered in a Trans Am race.